After hearty handshakes and friendly hugs with a lovely young couple and their daughter, we walked away thinking back about seven years earlier. When I first met them, they sat quietly, eyes staring forward, unanimated, and I presumed, sadly. I had heard that they were coming in. The six-month old baby girl with them seemed unusually quiet as well. The story stared with a pretty typical ear infection but something changed. She had become obtunded, lethargic, but also irritable. An urgent trip to the pediatrician resulted in emergency hospitalization and a spinal tap. Meningitis had only been a vague term, not a familiar entity, not a personal reality. Its dreaded complications were even more unknown. On two intravenous antibiotics, initial hope that their third child, a girl after two boys, would rapidly improve faded as her lethargy persisted. Five days into treatment, the reason became apparent: the bacteria were resistant to the usual antibiotics. With a medication change, she turned the corner and her personality showed glimmers of her prior vivaciousness. Soon thereafter, auditory brainstem response testing confirmed a major complication: the baby was now deaf, no signs of any ability to hear, not electrical and not even to loud sound. And that’s what brought them to see me, and ear specialist. Partners for better hearing Phonak and Advanced Bionics have released their new Naída CI Q90 sound processor. 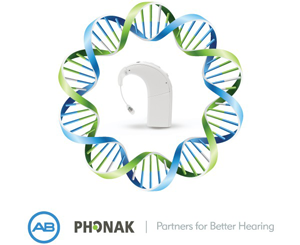 The new processor sports a new thinner & smaller design, performance enhancements brought by Phonak, and a plethora of wireless connectivity options. It is an exciting time to be getting a cochlear implant. 55% improvement in speech understanding in noise when Advanced Bionics ClearVoiceTM technology and the PHonak UltraZoom feature are used together. 100% wireless connectivity to consumer electronics – streaming from Bluetooth devices, phones, and countless other popluar products by leading brands, including Apple, Samsung, and Nokia. Bimodal first – media can be streamed to a compatible Phonak hearing aid and a Naida CI sound processor at the same time! All – new Binaural VoiceStream TechnologyTM designed for improved hearing in noise. First-ever bilateral feature for easy use and peace of mind – each processor can be programmed for both sides so the best ear can still hear if a processor is misplaced. 40% smaller than the previous behind-the-ear sound processor – incredibly lightweight for barely noticeable on and off-ear comfort. Proven Advanced Bionics technology, including ClearVoice, AutoSoundTM, HiRes Fidelity 120TM, and HiResTM Optima sound processing. Although smoking and secondhand smoke exposure are associated with sensory hearing loss in children and adults, the possible association between prenatal smoke exposure and hearing loss had not previously been investigated. More than 12% of US children experience prenatal exposure to nicotine. Hearing test data were examined for 964 adolescents aged 12 to 15 years from the National Health and Nutrition Examination Survey 2005-2006. All children had undergone standardized audiometric testing. Blood tests and self-reports were used to identify adolescents exposed to secondhand smoke or active smokers. Prenatal exposure was defined as an affirmative parental response to, “Did the biological mother smoke at any time while she was pregnant with the child?” Standard criteria were used to define hearing loss. Study Results: Parental responses affirmed prenatal smoke exposure in 16.2% of 964 adolescents. Prenatal smoke exposure was associated with at least some degree of hearing loss in the high frequencies. As well, prenatal tobacco exposed children had a higher rate of single sided low-frequency sensory hearing loss. Conclusions and Relevance. Prenatal smoke exposure is independently associated with higher pure-tone hearing thresholds and an almost 3-fold increase in the odds of unilateral low-frequency hearing loss among adolescents. These findings suggest that in utero exposure to tobacco smoke may be injurious to the auditory system. Of the three hearing bones, the one most likely to become “stuck” or “non-mobile” is the third one, the stapes bone. All three hearing bones oscillate in response to incoming sound. The stapes bone transmits that sound vibration to inner ear fluids where the vibrations stimulate inner ear sensory hair cells. On a fairly rare basis in some children, the third hearing bone, the stapes bone, is non-mobile from birth as a result of a genetic defect or developmental error sometime, probably, in the 2nd trimesterof gestation in the womb. Also fairly rare is that some older children and teens suffer from a disease called otosclerosis. In otosclerosis, the stapes bone becomes stuck, non-mobile, first starting as a minimal problem, and then getting progressively worse. The pattern of hearing loss is quite similar in both groups. On CAT scan imaging, the birth defect problem may have minor abnormalities of the inner ear and somewhat misshapen first (malleus) and second (incus) hearing bones. Some CAT scans looking at the birth defect problem find no abnormalities. The otosclerosis problem is almost always visible on the CAT scan, differentiating from the congenital problem. This article set out to compare how these two groups of children and teens improved with surgery on the stapes bone. The measurements were hearing tests and chart reviews to see what complications might have occurred. Forty-four pediatric ears were studied, 27 with a congenital stapes problem and 17 with otosclerosis. Those with the congenital defect came to surgery at an earlier age, as expected, than did the otosclerosis group. Thirty seven percent of the congenital group had minor other hearing bone malformations whereas none of the otosclerosis ears had hearing bone problems other than the non-mobile stapes. Those who had otosclerosis generally gained a little more hearing from surgery than did the congenital ears, probably because some of the congenital ears had more wrong than just the non-mobile stapes bone but both groups uniformly gained hearing in a “statistically significant” manner following surgery. There were no cases of deaf ear and inner ear function remained stable in all but one ear which was a bit worse. There were no cases of serious complications, in either group. Compared to other published medical literature, this article had quite similar outcomes. Another disease entity which can cause a non-mobile stapes is called “tympanosclerosis.” Published literature reviewing stapes surgery in ears with tympanosclerosis found hearing gains from surgery to be less than with the congenital problem and the otosclerosis reviewed in this article. The authors’ conclusion: When performed by an experienced surgeon, stapes surgery is safe and effecive in children who have either problem, although hearing results are generally better with otosclerosis than with the congenital problem. Advantages of hyaluronic acid fat graft myringoplasty over fat graft myringoplasty. Perforations of the ear drum membrane in children are not rare and can be a side effect of having had middle ear ventilation tube surgery. When a perforation persists either from infection or an ear tube or both, the question is how best to repair such with the least risk, the least anesthesia, and achieving a sufficiently high success rate. Fat grafts have been used for this purpose for many years but do not have uniformly high success rates. Use of micro-perforated hyaluronic acid sheeting has not been effective, either. This study combined the sheeting with the fat and compared the healing probability to just using a small piece of fat by itself. It was used for perforations of the ear drum membrane that occupied no more than 25% of the tympanic membrane surface. Postoperative hearing outcomes were compared, as well. Ninety-two children with small tympanic membrane perforations were included in the study. Fifty were operated using either the sheeting combined with a small piece of fat and 42 were operated with the simpler, older fat placement technique. Age at surgery ranged from 4 to 17 years (mean age, 11.52 years). Results: Successful closure of the ear drum membrane was achieved in 90% of the combined sheeting/fat graft group and in only 57% of the plain fat graft group. The postoperative hearing was understandably better in the combined fat-sheeting group as well. The probability of success did not depend on how old the children were at the time of surgery. No postoperative complications were observed. The locationof the perforation in the ear drum membrane was not found to be a factor indicative of failure. Conclusions: The success rate of combining the hyaluronic acid sheeting with a small piece of fat was superior to the old technique of using fat alone. The Canadian authors suggested that this procedure could conceivably be done in a physician’s office. Our comments: The clear need for sterility and safe sedation make this procedure best if done at an ambulatory surgery center or at a hospital. In addition, this procedure has a success rate of about 90% and is limited to small holes in the ear drum membrane compared to 97-98% succcess rates for larger perforations approached more invasively. In other words, this procedure takes minimal time by comparison as a trade offfor slightly lower success rates with the advantage of less potential for scarring and its effects on hearing. This procedure, then, has a place for small, relatively uncomplicated perforations in ear drummembranes. The authors analyzed the findings of children who passed their newborn hearing screen and were subsequently found to have childhood hearing loss. They identified 923 children with hearing loss from 2001 to 2011. Of that number 78 were found who had passed the newborn hearing screening hearing test. The suspicion of hearing loss was raised by parental concerns in 28 [36%] and by failed school hearing screens in 25 [32%]. Speech and language delay and failed primary care physician screens accounted for 17% and 12%, respectively. Audiogram results were bilaterally symmetric in 42 [54%], asymmetric in 16 [21%]), and unilateral in 20 [26%]. Thirty-seven patients (47%) had severe or profound hearing loss. The cause was unknown in 42 patients (54%); the remaining was attributed to genetics in 13 [17%], anatomic abnormality in 11 [14%], acquired since birth in = 9 [12%], and related to auditory neuropathy spectrum disorder in 3 [4%]. Conclusions: This large study identified children who were later found to have hearing loss in spite of passing the newborn hearing screening test. Parental concerns and school hearing screens were the most common method to diagnose the hearing loss. Families and primary care physicians may have a false sense of security when infants pass newborn hearing screening testing and may overlook symptoms of hearing loss. This study suggests that 8.4% of children who have hearing loss are not discovered with newborn hearing screening. This study raises the question whether further screens would identify hearing loss in children after passing the NHS. In Ménière’s disease (MD), several factors can create postural instability. In a recent study, 54 definite MD patients were compared to 66 controls. Several tasks were tested: two-legged stance tasks were performed in 4 conditions: eyes open with and without foam rubber and eyes closed with and without foam rubber (also called sensory organization testing). Six variables in the manner of attempting these tasks were evaluated. For Ménière’s disease patients, statistical analyses were performed to explore the relationship between the 6 variables and the following independent variables: gender, age, the presence of abnormal caloric (abnormal in about half of Ménière’s disease patients) and/or cervical vestibular evoked myogenic potential (cVEMP) responses (neck muscle response to a click sound placed in the ear, also abnormal in about half of Ménière’s disease patients), the time elapsed since the last vertigo attack, and duration of the Ménière’s disease. Since MD patients might have diminished postural stability because of other factors, such as age and the degree of balance organ dysfunction at the time of testing, the purpose of this study was to assess the influence of various factors that can affect postural stability in MD patients, comparing MD patients with normal persons. To assess postural control, the research used a foam cushion posturography analysis system originally established by their team for improving diagnostic accuracy of peripheral vestibular disorders in accordance with the guidelines from the Standards for Reporting of Diagnostic Accuracy. Results: The presence of MD was significantly associated with abnormalities of all 6 of the variables. The presence of abnormal ear responses to warm and cool irrigations of the ear and cVEMP responses also correlated strongly with difficulty standing eyes closed, feet close together and the rate of leaning in that condition. The shorter time interval from last vertigo attack to measurement, the more likely patients with Ménière’s disease were to have trouble standing on a foam cushion with eyes closed. These results indicate that MD patients with abnormal caloric and/or cVEMP responses have a greater dependence on visual and somato-sensory inputs (joint position sensors in the back, hips, knees, and ankles) to maintain an upright posture than those subjects with normal caloric and cVEMP responses. Conclusion. Ménière’s disease patients show poor postural performance, which is affected by the existence of their peripheral vestibular function and the shorter time interval from last vertigo attack to measurement. Comment: While Ménière’s disease patients complain more about the abruptly disruptive spells of vertigo that they suffer, they also have chronic balance problems of variable severity that fluctuates in its distracting features with the frequency and severity of the Ménière’s disease episodes. Congenital aural atresia is a birth defect that consists of absence or a severely narrow external ear canal. The eardrum membrane and hearing bones are commonly also deformed and other abnormalities may co-exist in the middle ear. It is almost always accompanied by a malformed (microtia) or absent (anotia) external ear. Atresia and microtia are common congenital malformations, with the incidence of microtia reported to be 0.5 to 3 per 10000 live births, and congenital aural atresia is reported in 55% to 93% among individuals with microtia. Microtia is unilateral in most patients, more commonly in boys and more commonly on the right side. While children with bilateral hearing loss are known to be at increased risk of speech and language delays as well as poor performance in school, the clinical significance of single sided hearing loss is not universally recognized. Common thought has been that children with single sided hearing loss were thought to develop speech and language normally and most have not received hearing aids. However, a number of small studies of children with single sided hearing loss have shown delays in word acquisition in younger children, increased grade failure rates, and a higher probability of needing speech and language services. Significant deficits for these children exist in language comprehension and oral expression. While these findings are significant, it is unclear if they can be extrapolated to children with unilateral congenital aural atresia because most of the children in prior studies of single sided deafness had profound sensory hearing loss whereas the children with congenital aural atresia typically have normal inner ears and their problem is limited to the middle ear and external ear canal. Also unclear was whether the side of the congenital ear canal atresia might impact development of speech and language. For this study, the authors reviewed records by audiologists, speech pathologists, and psychologists looking at the incidence of speech and/or language delay, the incidence of needing speech therapy, and other educational interventions. Also checked were parental reports of social problems. Seventy-four children were identified with singled sided congenital absence of the ear canal: 48 on the right-side; 19 on the left-side, and 7 with bilateral absence. Children with this birth defect demonstrated high rates of utilizing speech therapy (86% among bilateral, 43% among unilateral). Reports of school problems were more common among children with right-sided (31%) than those with left-sided ear canal abnormalities(11%). Special educational interventions were common in all groups (33% right, 21% left, 43% bilateral). In the case of bilateral AA, all children who received additional interventions were enrolled in schools for the hearing impaired, without any other specified learning deficiencies. Conclusions and Relevance Children with single sided abnormalities of the outer ear canal are at greater risk of speech and learning difficulties than previously appreciated, with rates similar to children with unilateral inner ear (sensory) hearing loss. This group of children has an obvious need for more study of how best to assist them. Our Christmas tradition for over 30 years has been turkey and dressing and family with a reading of the Advent passages. Our celebration used to have more family over, but we are a smaller crowd, now. Only my wife’s mother was to join us. Even with a smaller turkey and less stuffing, the house was festively decorated, fitting for a quiet distinctly Christmas day. Up early together to stuff the turkey, my wife heated some water, melted the butter, and folded in just a half bag of Pepperidge Farm Onion and Sage cornbread dressing as I chopped scallions, onions, celery, and parsley to complement the stuffing. From a small turkey, giblets were diced and placed in a pot with water to simmer with bay leaves, oregano, poultry seasoning, garlic powder, salt and pepper. The aromatic herbs forecast a fragrant broth which, when blended with a flour and oil roux, makes the most wonderful gravy. After stuffing the turkey, we placed it in the oven and my wife set the leftover stuffing aside. She planned to go for a quiet morning coffee and pastry with her 90 year old mother. “Gamma,” to our Down’s syndrome son, would take her usual mid-morning nap. My wife, too, would have a restful morning, luxuriating a bit in that lovely assisted living facility efficiency, leaving the rest of the cooking to others. “Gamma,” spreading Christmas joy in her uniquely New York Italian way, and my wife would join the Christmas table in a few hours. While I cleaned the kitchen, my college-age daughter was working on the yams with a top secret idea. No way was I to learn what she was up to until the creation was finished. The dishwasher was filled with prep dishes and my son’s early cereal remnants. The drips had all been cleaned up and the herbs were back in their places. The onion skins with celery and scallion trimmings were ground down the garbage disposal. The larger prep pans were washed and put away. Even with the exhaust fan running, the simmering giblets were broadcasting aromas and whetting appetites. A rumbling midriff whimpered, “I’m hungry, HUNGRY!” My mind drifted the potato pancakes I had made for the office staff a few days before: shredded potatoes, eggs, a bit of flour, onion, and for holiday color, finely sliced green and red peppers, and shredded carrots. The pancakes had been dressed with a mix of two parts apple sauce and one part cranberry sauce. Fondly remembering that time with my staff, my hunger grew. “What should I have for breakfast?”… “An omelet!” …“A Pepperidge Farm Onion and Sage dressing omelet,” I told my daughter. Her eyebrows curled upwards wrinkling her forehead and her lips formed a wryly quizzical way, but her focus remained on her yams-inspiration. Into a skillet with melted butter, less than a cup of residual dressing with celery, onions, scallions, and parsley blended with two eggs, and a dash of salt and pepper. After browning the first side with medium heat, lowered heat for the second side promised a well cooked center. “Almost like bread pudding custard,” I thought as I set a fork and a glass of orange juice with a coaster on the decorated table in front of a bay of windows. It was covered with a lovely flowered Christmas cloth, under laid with a medium green skirt. A thick red candle adorned the center along with a tiny manger scene, my wife’s lovely blend of holiday colors. Christmas morning was a Florida-style overcast winter day, drizzly and cool, evidence of a cold front ushering in a relatively bright morning. From light intermittent rain all night, the pool enclosure was shedding rivulets of water, making the lanai look like a tropical garden with potted palms, philodendrons, and schefflera, even a few orchids, and geraniums with blooms. Beyond the lanai, the golf course looked like an endless manicured lawn. Distant scrub oak and pine trees mixed with a few scraggly palms bordered the ill defined, low lying skyline above which well lighted clouds were still dripping with moisture. Ligustrum trees, a large gardenia bush, two bottle brush trees, and a bare crepe myrtle filled the foreground. A bird bath full of rain water silently invited feathered friends of all sorts. “A lovely place on a quiet Christmas day,” I mused. Musical bubbling from the coffee maker turned my attention back prompting a check of the slowly curing omelet, not yet brown on the second side. The giblets were checked, their low boil spreading aroma images of fragrant gravy, a wonderful blend of oregano and garlic. “Freshly sautéed mushrooms will complement the gravy perfectly,” I thought, remembering the recipe of butter, olive oil, garlic, salt, and pepper in which to sauté them. I could almost taste them. The cooktop spoon rest needed washing. Done. Stains dried on a cooktop burner were vanquished with Softscrub. A repetitive tone signaled that the oven had just reached cooking temperature, turkey baking suitably underway. My daughter finished a special topping for the yams, crumbled brown sugar on top of yam juices blended with pumpkin style spices. The creation was in a Corning Ware dish, ready to be baked in the second oven, later. “So, that was her secret!” I noted while bringing a small plate to the cooktop. I dished out the fully cooked omelet just as my wife appeared at the kitchen door, finally reaching the source of the Christmas fragrances. Her warm colorful sweater and purse said that she was about to leave. “Just a little bite before you go, honey?” I cut a fork full and fed it to her. “Oh, that’s sooooo gooood! What is it?” “Another?” “Yes, …..mmmmm, thank you, Honey.” Touching my shoulder gently, she kissed me and with that, she was off to her mother’s place, promising to be back in time. My daughter came in with her Yorkie, Kuuipo. “A bite for you.” “Ok, but I’m not so hungry…hmmmmm, good. I knew it would be.” I peaked past the kitchen desk into my son’s bedroom. He had gone back to sleep and seemed quietly comfortable. Christmas music gently filled the room and the Christmas tree with its lights and gifts sparkled in the morning light, engendering a quiet joy, presaging “Gamma’s” arrival for the extra chair around the table. As I sat overlooking the pool, the golf course, and gray winter skies, cool air convecting down the tall windows, the aroma of a cup of freshly brewed decaf turned my head back to a small glass of orange juice and the fragrant celery-onion-sage-stuffing omelet in front of me. Leftovers. Squeezed back memories from long-ago. The eager first time was delicious. From a thrill to the “will you?” precious. Hands held before a minister. Slipped easily past beautiful nails. Hands that co-signed legal entities. But never hands of malevolence. And finally his cooling hand with grace. Hands that assisted her mother. Hands that found her mother’s gnarled fingers. The best guide is her mother we’re told. Her mother’s hands gestured Italian style. Her mother’s busy hands happily prepared meals. But with hearty husky voice, she still sings. Gnarled hands that prepared meals remain soft. The gnarles still smile, laugh aloft. Mirroring the intent of a gracious lady. Gnarles still welcome and hold a grand baby. May disrupt sleep, so terribly distressed. They are lovably, sweetly, wonderfully gnarly.